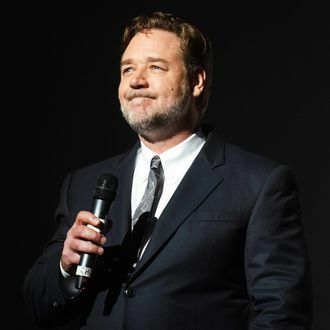 Over the course of Russell Crowe’s marriage to Danielle Spencer, the actor accumulated a lot of stuff, and now that they are about to be officially divorced, he is putting a lot of it up for sale. On April 7, Sotheby’s will host the sale of Crowe’s belongings, and it’s actually called “The Art of Divorce,” which is the same date as both Crowe’s birthday and the anniversary of his wedding. (The print version of the sale catalogue features Crowe in a tuxedo, smiling slightly and raising a toast to the camera, so there’s a thick layer of dark humor here.) The docket is filled with objects you’d expect, like heaps of memorabilia from his movies, a sizable collection of works by Australian artists, fine watches, a ton of cricket-related items, and a lot of guitars from his days rocking out in the band 30 Odd Foot Of Grunts. But, because Crowe is rich and people are very strange, it’s also got some weird stuff you can buy for a lot of money! So here are the nine standout items from “The Art of Divorce” auction lot. Act now, and you might be able to score some dinosaur bones he bought from Leonardo DiCaprio! On your mantel you can place the framed black-and-white of Crowe and Thompson next to your own family’s portraits, and you can nestle the creepy doll from the 1994 film The Sum of Us in between them. Bonus: The back of the frame is signed by Crowe, so you don’t use your own frame. Estimated price: $400-$600. These huge, uncanny valley horses are about seven feet tall by seven feet long, and are described as “realistically rendered in rubberised material with textured chestnut faux fur and mane, supported on a custom designed steel stand.” The two horses are sold separately, but how could you think of owning just one? Place them both directly behind your front door for maximum effect, or hang them over your grand foyer. Estimated price: $2,000-$4,000 each. A “boxer’s protector” seems to be the 1930s version of a padded jock strap, and you can own the one Crowe wore as James Braddock in the 2005 period drama. No judgments here. Estimated price: $500-$600. Own this signed oil-on-composition-board painting of a silly monkey! Estimated price: $30,000-$50,000. The description for this lot item literally calls it “monumental,” and with each panel of the screen measuring almost eight feet tall by just over two feet wide, that adjective seems fair. It might take up a whole wall in your smaller salon, but is this lovely leather painting of a pastoral landscape worth it? Of course it is. Estimated price: $25,000-$35,000. The title of this item is a long way of saying: A white plaster bust of Muhammad Ali’s face. A legendary boxer’s visage with his eyes closed might sound like a real statement piece, but at just about eight inches tall, this item is really more of a desk ornament or book-shelf accompaniment. Discreet, for the discerning plaster-cast enthusiast. Estimated price: $800-$1,200. Obviously Russell Crowe would have a set of dueling pistols, but lot notes do not say how often Crowe used them for actual sporting duels in his own life. The pistols are marked No. 1 and No. 2, and each has “a brass barrel, silver plate and steel fittings and horn mounted ebonised plunger, within a later fitted and velvet lined walnut case applied with foliate brass strap work, each pistol with an oval brass disc stamped ‘F. HOUSE.’” Dispatch your foes with the utmost class. Estimated price: $5,000-$8,000. In the item notes for the most expensive piece in “The Art of Divorce” collection, Crowe says he wanted his gruff Master and Commander character, Captain Jack Aubrey, to play a very elegant instrument, so he had a musician friend and his violin teacher track down this Italian-made violin from 1890. It comes with a faux-Baroque bow and also the piece of silk Crowe placed under his chin when he played. Estimated price: $110,000-$140,000. We saved the best of the list for last. Dinosaur bones! The skull — found in the Niobrara Formation in Kansas — comes mounted on a black metal stand and is placed within glazed display glass. According to the notes, “Mosasaurs were formidable hunters, with a double-hinged jaw and a flexible skull enabling them to eat their prey whole.” Also, Crowe apparently bought it from Leonardo DiCaprio. Estimated price: $35,000-$40,000.